Between the 20th and 21st century, a number of people lost their lives in South Africa amid liberation struggle. However, some of these events were carried out beyond the borders of South Africa by members of security police as they became known as cross border raids. Other events emerged from wage strikes. In the early 1990s, the political violence claimed a number of lives particularly among Africans. 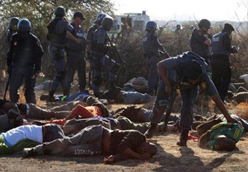 In August 2012, the history repeated itself when 34 mineworkers were shot and killed by police while on wage protest at Marikana, North West Province. A strike of 9000 African miners takes place at Jagersfontein Diamond mine, after a fellow-worker is kicked to death by a White overseer. White employees join in brutally suppressing the strike. Eleven African mineworkers are killed and 37 injured. 24 May, the Smuts government took action against a black sect, the Israelites, under the leadership of Enoch Mgijima, who squatted at Ntabelanga near Bulhoek in the Queenstown area of the Eastern Cape. The police issued an ultimatum demanding that the Israelites evacuate the area and warning that if they failed to comply, their leader would be arrested and their homes demolished. Soon afterwards the Israelites launched an attack armed with clubs, assegais and swords. They were fired upon by the police and more than 180 people were killed and more than 100 were wounded. May, the 1922 mineworkers strike becomes a seminal event in SA's history. Scores of people lost their lives; official records list the number of dead people in the episode as 129 soldiers and policemen, 43 civilians and 39 miners. It took on the dimensions of a revolt when the miners organised themselves into armed commandos. 12 August, African mine workers of the Witwatersrand went on strike in support of a demand for higher wages - 10 shillings a day. They continued the strike for a week in the face of the most savage police terror, in which officially 1,248 workers were wounded and nine people were killed. Lawless police and army violence smashed the strike. The resources of the racist State were mobilised, almost on a war footing, against the unarmed workmen. 01 May, 18 protesters are attacked and killed by police in Alexandra and other surrounding areas while engaged in a general strike held in favour of full franchise and against discriminatory laws. 24 January, nine policemen were killed by an angry mob at Cato Manor in Durban. The incident happened after a routine raid by police searching for illicit liquor. They were stoned and hacked to death. The police attempted to escape after they were ambushed, but were overwhelmed by the mob. Among those killed were four White policemen and five Blacks. 21 March, a breakaway organisation from the African National Congress (ANC), the Pan Africanist Congress (PAC) staged an anti-pass demonstration outside Sharpeville police station near Vereeniging. They handed over their passes demanding an end to the pass laws. However, the march ended in tragedy when the police opened fire on the marchers, killing 69 people and injuring close to 200 people, in what has come to be known as the Sharpeville Massacre. 17 June, 25 pupils are killed by the South African police during a school boycott and a general rioting in Elsies River near Cape Town. 30 January, 12 people are killed in Operation Beanbag, an attack by the South African army on the planning and control headquarters of the African National Congress (ANC) in Matola, Mozambique. A total of 15 members of uMkhonto we Sizwe were killed in the raid. In addition, a Portuguese engineer Jose Ramos was "mistakenly identified" by the South African forces as Joe Slovo, one of the raid's main targets, and was shot at a roadblock. 9 December, A cross-border raid by South African Defence Force (SADF) Commandos kills 12 Lesotho nationals and 30 South Africans (most of them members of the African National Congress- ANC) in Maseru, Lesotho. Among the dead were children, students, refugees and visitors from South Africa. According to a statement by the South African government the following day, the SADF claimed to have successfully attacked 12 ANC 'terrorist targets' within Lesotho. 20 May, 19 South African Defence Force (SADF) and South African Police members are killed after car bomb explodes at the headquarters of the SADF in Pretoria. 23 May, Following the African National Congress’s (ANC) 20 May 1983 car bombing of headquarters of the South African Defence Force in Pretoria, ANC bases in a suburb of Maputo, Mozambique's capital city, are bombed in retaliation, leaving 6 people dead. September, The South African police in the Vaal Triangle kill 26 protesters as the clash between them and police intensify. The residents were protesting against rent increases. 18-19 February, 18 protesters are killed by the South African police in Crossroads near Cape Town as they were resisting forced removals to the newly-built township of Khayelitsha. 21 March, As part of commemorating the 25th anniversary of the Sharpeville shootings, a large crowd from Langa, Uitenhage begins marching to KwaNobuhle Uitenhage to attend a funeral that had in fact been banned. On the edge of white Uitenhage, through which they had to pass to get to KwaNobuhle, they were confronted by two police vehicles and a contingent of police who instructed them to disperse and then opened fire killing 20 people. 14 June, 13 people are killed in Gaborone, Botswana including, Thamsanqa Mnyele who was a very active cadre in the uMkhonto we Sizwe (MK), the military wing of the African National Congress (ANC). 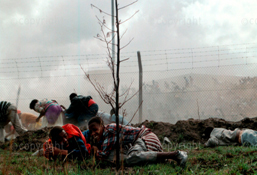 26 June, 10 people are killed by South African police in KwaThema, Springs, a township on the East Rand. 5-14 August, In a period of less than two weeks, 70 people are killed as clashes between police, amabutho (IFP regiments) and activist intensify. 11 August, 23 people are killed by police in Duncan Village, East London in the Eastern Cape. 28-31 August, An estimated 31 people are killed by the South African police following a riot after Mandela march. 18 November, 14 people are killed by the South African police in Queenstown, Eastern Cape. 21 November, Police open fire on a crowd gathering in Mamelodi, Pretoria killing 12 people. The people had gathered to protest against the army’s presence in the township, high rents, and the imposition of restrictions on the holding of the funerals. 20 December, Six South African nationals and three Lesotho nationals are killed in Maseru, Lesotho. 30 December, 11 people are killed by an angry mob at Gugulethu near Cape Town. This happened after the killing of a community councillor. 1 January, 12 people are killed by an angry mob in Moutse, KwaNdebele. KwaNdebele vigilante attack on Moutse villagers is triggered by government’s promise that the area would be transferred to the homeland on New Year’s Day. 15-21 February, 27 people lose their lives after as a clash between police and youth intensify. This was after the funeral of a schoolboy who was killed by a shopping complex security guard. 3 March, Seven African National Congress (ANC) guerrillas are killed by the South African police in Gugulethu near Cape Town. 26 March, 26 protesters are killed by Bophuthatswana police in Winterveld, Bophuthatswana. 26 March, 13 rioters are killed by police after a crowd stormed a bottle store in KwaZakhele, Port Elizabeth. 23 April, Nine Alexander residents are killed by the South African police following a rent stayaway called by the Alexander boycott committee. 17-26 May, within a space of ten days, 44 people are killed in ‘Witdoeke’ clashes in Cape Town Squatter camps. 20-25 May, 11 people are killed in KwaMashu, township outside Durban following the outbreak of amabutho (regiments) clashes. 9-11 June, 11 people are killed in ‘Witdoeke’ (white headband) clashes in Cape Town Squatter camps. 6 July, Nine Katlehong, East Rand development board members are killed by unknown people while patrolling in two attacks. 26-27 July, 24 demonstrators are killed by the South African police in White City, Soweto as a clash between police and residents on rent boycott intensifies. 21 January, 12 people who were guests at the Ntuli family home (family of a United Democratic Front member) are killed by vigilantes. 25 September, 13 Inkatha Youth Brigade (IYB) members including three off-duty police officers are killed while attending a meeting. 3 December, 11 people are killed by South African police while attending an all night funeral vigil aimed at remedying lack of support for Inkatha Freedom Party (IFP) Chairman, Jerome Gwala. 6 September, 29 demonstrators are killed by South African police in Cape Town while protesting election. 22 July, 19 people are killed, allegedly by Inkatha Freedom Party (IFP) in collusion with South African police during the IFP launch at the Sebokeng Stadium in Vaal. 23-25 July, In retaliation of the killings of the 22 July in Sebokeng, 30 people are killed in the area allegedly by Inkatha Freedom Party (IFP) members. 1-11 August, 13 are killed in Sebokeng, allegedly by IFP members in collusion with South African police. 5-23 August, About 122 Soweto residents are killed, allegedly by IFP members in collusion with South African police. 12-15 August, About 150 Tokoza residents are killed, allegedly by IFP members in collusion with South African police after forced expulsion of non-IFP from hostels and attacks on Phola Park. 14 August, 24 Katlehong residents are killed, allegedly by IFP members in collusion with South African police during pre-dawn attacks on Crossroads squatter camp. 1-2 September, 44 residents in Tokoza, Tembisa and Vosloorus are killed during attacks on townships. 4 September, 19 hostel dwellers are killed, allegedly by IFP members in collusion with South African police. 4 September, 11 hostel residents are killed allegedly by IFP members in collusion with South African Defense Force. 8-9 September, 26 residents in Tladi township are killed allegedly by vigilantes. 28 October, 16 residents of Naledi Township in Soweto are killed, allegedly by IFP members in a revenge for the IFP member who was killed. 15-19 November, 34 residents of Katlehong, a township also located on the outskirts if Johannesburg are killed, allegedly by IFP supporters in an attempt to take over Zonkizizwe squatter camp. 26 November, 13 Dobsonville hostel residents are killed allegedly by vigilantes. 26 November, 11 Katlehong residents are killed by vigilantes during a night attack at the Mandela View squatter camp. 2 December, 30 people are massacred in Tokoza a township on the outskirts of Johannesburg, allegedly by IFP supporters as political violence intensifies. 3-8 December, In an ongoing series of attacks and revenge attacks 33 people are killed in Tokoza, East Rand as political violence escalates. 11 December, 52 people are massacred in Tokoza Township, allegedly by IFP supporters. 12 January, 45 African National Congress (ANC) mourners are killed in Sebokeng, allegedly by IFP members in collusion with South African police while attending a funeral vigil for ANC member. 3 March, 24 IFP members are killed, allegedly by Xhosa speakers in Meadowlands, Soweto in an attempt to take over the Mzimhlope hostel. 24 March, 12 African National Congress (ANC) supporters are killed in Daveyton, Gauteng, allegedly by South African police. The incident unfolded when police was dispersing an ‘illegal’ gathering. 14 April, 11 Nancefield residents are killed following a Clash between Nancefield hostel and Power Park squatter camp. 28 April, 10 IFP mourners are killed in Meadowlands after a service for assassinated 1FF leader. 23 May, 13 Sebokeng residents are killed while in a beer-hall. 8 September, 13 IFP members are killed under mysterious circumstances in Mofolo, Soweto. 8 September, 23 IFP supporters are killed in Tokoza by 3 unknown gunmen as political violence escalates. 13 October, 10 Mapetla township residents are killed by unknown gunmen in a tavern. 17 June, The Joe Slovo Informal settlement in Boipatong outside Vereeniging is attacked by a group of about 300 armed men from Kwa Madala Hostelin nearby Sebokeng Township killing 46 people and injuring others. The armed men were affiliated to the Inkatha Freedom Party (IFP) and observers suspected that the attack was aimed at undermining the delicate process of negotiations between the Nationalist Party (NP) government and the African National Congress (ANC). 7 September, Around 80,000 protesters gathered outside of Bisho, the capital city of Ciskei (an independent homeland or Bantustan), and demanded an end to the military government of Brigadier Joshua Gqozo and incorporation of the Ciskei into South Africa. Soldiers then opened fire killing 28 protestors and one soldier, and injuring over 200 others. 18 November, Ten Sebokeng residents are killed, allegedly by uMkhonto weSizwe members. 18 April, 19 Sebokeng residents are killed by gunmen driving through the area, opening fire randomly for four hours. 26 June, 12 Sebokeng residents are killed by gunmen driving through the area, opening fire randomly. 12 July, Less than a month after the 26 June massacre, 14 Sebokeng residents are killed by gunmen driving around the area. 16 August, South African police open fire on striking miners armed with machetes and sticks at Lonmin's Marikana platinum mine, killing at least 35 people. In the days leading to the massacre, 11 people were killed allegedly by mine workers. This is the first incident of this nature post 1994 democratic election.